I love baking bread. There is nothing more welcoming and comforting than the smell of freshly baked bread. I remember passing Oven Door in Westlands and could smell baked bread for miles. Well not miles but I would always want to pass by it to get the aroma of bread baking. We must have even pestered our mum to buy the fresh loaves for us. Though I find kneading the dough quite a task, I love the end result. I think I should buy a food processor to make kneading easy. I have baked so many buns, so often for the devotees of Hare Krsna when my in laws were in Mombasa. Soup and hot buns is an unbeatable combination. Its nearly 4 years since I posted this recipe. 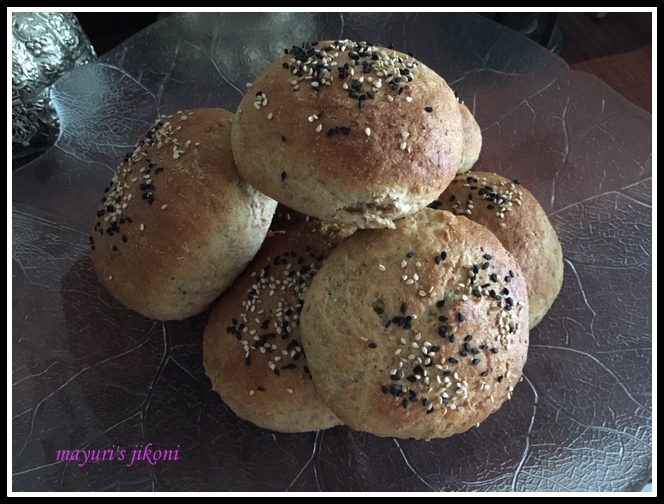 Several times I tried making wholewheat buns and always wondered why they do not turn out like the ones made with plain flour.I didn’t know much about gluten formation and all technical stuff about bread making when I first posted the recipe. Over years I have baked a lot more breads and in the process learnt a lot from fellow bloggers and by reading articles. However my search for a 100% wheat flour bread continued. Then I came across the a recipe by Simply a Blog using only wholewheat flour and not a combination of wheat flour and plain flour. Also got to learn about the tangzhong method on that site. I tried out the recipe twice. The first time the bread was much lighter than my first ever attempt but the dough was just too too soft and I think I didn’t prepare the tangzhong roux well.My second attempt was better as I knew where to adjust my mistakes. Today I baked the rolls for the third time and was really happy with the end result. My first photo of wholewheat bread, will not be deleted as its a reminder to me that we are never ever going to know it all and that learning is a life time process. If we are open to new ideas and information then room for better change is rewarding. Read more about autolyse here. Read more about tangzhong method here. Mix flour and water in a pan. Put the pan over low heat. Stir the mixture till it thickens and coats the back of a spoon. It should have a custard consistency. Or if you have a food thermometer, it should reach 65°C. Cover the mixture with cling film. The cling film should touch the paste. This will prevent a skin forming on top of the paste. Let the roux cool down. Mix the flours in a big bowl. Add salt and yeast and mix well. Add the roux, oil, water and honey. Mix the dough using a spatula. The dough will appear shaggy.Cover the dough with a cling film or a tea towel and let it rest for 1 hour. This will help to develop the gluten. This process is called autolyse. Sprinkle a bit of flour onto the work top and knead the flour for at least 10 minutes till it is smooth and elastic. Divide the dough into 12 or 10 parts. Grease a baking tray with little oil or line it with parchment paper. Take one part of the dough and roll it into a ball. Place it on the tray. Repeat the above step with the remaining dough. Cover the buns with a tea towel and let the dough rise for 1 hour or till the buns are double the size. Brush the top of the buns with milk. Sprinkle some sesame seeds on top. Bake the small buns for 15 mins and the medium ones for 20-25 mins or until the top is golden brown. When you knock the bread with your knuckles it should sound hollow if it is done. Remove from the oven. Let the buns cool on a wire rack. Use a food processor to knead the dough if you have one. If you are using normal dry yeast, then you will have to sprinkle it onto the lukewarm water to activate it. Add honey to the water. Let the mixture rest for 10 minutes. The mixture will become frothy. Instead of milk you can use an egg mixed with a bit of water as a wash or brush the hot baked buns with butter. Can use oats, cracked wheat, sunflower seeds, herbs etc as topping. Put the dough in the oven, or you airing cupboard. Any place that is pretty warm.